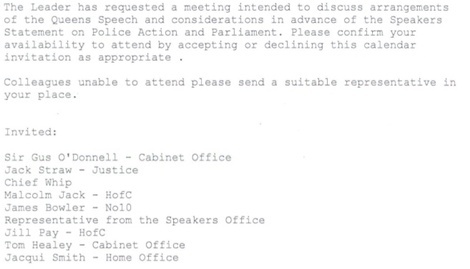 The Conservative Party has tonight published an email from Harriet Harman's office that sets up a meeting between officials in the Speaker's Office and in the Government machine - clearly designed to handle the outrage from MPs that is anticipated on Wednesday regarding Michael Martin's permission for counter-terrorist police to raid Damian Green's parliamentary offices. Not only is such a meeting entirely improper - the Speaker is the servant of all MPs, not the executive/ government - but yet again Labour displays its incompetence; the email has only come to light because Ms Harman's office accidentally cc'd the office of a Tory frontbencher. PS The Damian Green ribbon is the brainchild of the irrepressible Tory Bear. It does make one wonder what other improper meetings have been orchestrated by the Labour government over the years. Should we expect Harriet Harman's resignation for impropriety in post to be added to those of the Home Secretary and Speaker? You'd think this was part of a hysterical sketch from 'Only Fools And Horses'. But it's not. How long do the people of the United Kingdom have to suffer the ineptitude and impropriety of this Government? They are a blight on our democracy! The Speaker might not be bright enough to understand the rules* but Harman is a lawyer. *that's not an excuse, it's a reason for him to be removed from office. Accidently CCd in, yes of course it was . I take it , that this tory backbencher will now get his( or her ) collar felt my PC Plod. Do I understand this correctly, the senior Civil Servant in the Cabinet Office, representatives of No 10 and the Speakers Office are attending a briefing of Labour MP's on how to behave when the Speaker makes an announvement regarding his conduct. First of all why is a representative of the Executive attending a parliamentar briefing? Second why is the supposedly impartial Speaker dealing exclusively with the parliamentary Labour Party? I think we know the answers. Where can you get the green ribbons? Coming from the cabinet minister who, as legend has it, set up her website with username:harriet and password:harman, perhaps she ought to go on a computing course at the taxpayers' expense just as Hazel Blears did with her Spanish. Mind you, as a Telegraph letter put it yesterday, they've all been on an economics course at the taxpayers' expense recently. I hope that on Wednesday, we'll see 198 green ribbons on display, plus a few more. It would appear the Home Office is leaking like a sieve; the civil servants there obviously can't stand Jacqboots any more than we can. I wonder who'll be getting a knock at the door this time, pour encourager les autres? Missing apostrophe between Queen and sSpeech. These people are in charge of what? Yes but can the Tories use this correctly? They are completely frightened stiff by the BBC. They are completely wet. Show some guts Tories, my goodness we need you to do so. and Speaker and s Office. Oh dear, it would seem that they are "getting together to sort out their statements on a crime", Just like the police do in fact? You know? So that there aren't any inconsistencies and such. Is this allowed? I believe it was theyoungconservative.co.uk that designed the green ribbon. Never mind all considerations about the appropriateness of this - what about the grammar? Don't these people understand how to use the possessive? Egits. And whilst I'm ranting, any Tories out there want to join me in nominating David Moyes for a knighthood (for services to lost causes)? Queens Speech is correct. Word has it that it was His Lordlessness wot rote it! As mentioned somewhere else I just read, it's plain that this leak was done expressly to damage Harman, someone in the email receivership is probably a bit peeved she stabbed Jaqui in the back with her Sky interview and not following "the party line! ", Probably the Speaker actually! New Poll - a rogue, or I'm leaving the country. I mean it; if people are stupid enough not to see what's going on at the moment I don't want them picking the government. Surely nobody is in the least bit surprised that the McSpeaker is in McLabours pocket.....why the hell do you think Bliar the liar appointed him!......jobs for the McBoys. And right on cue a nice rigged Poll!. The Labour regime have no shame in this, the worse they are doing the better they appear in the "Polls". Just treat it with contempt, they are out by landslide. Just took a look at the Comres site and that's what those polling numbers are indeed what new-poll says they are! what? I would suggest ignoring it as it seems totally erroneous. Apparently the regionals on this are bonkers - Labour ahead 36 to 34 in the South East; Tories ahead 51 to 31 in Wales. WALES! Someone wrote on a blog, somewhere that the BBC put the Damian Green affair way down on it's priorities. Tonight I've looked at all the major newspaper websites and the only one that I couldn't find much imformation was the Telegraph. I've noticed in recent times that anything critical of the Government is way down the list of Telegraph stories. Is it me? When the Guardian is focusing on it, why is the Telegraph ignoring it? I'll tell you why, since their new political editor took over, Tory support, in the paper has crumbled. Andrew Porter is a Nu Labour stooge, I just wish George Jones would come back and take the Telegraph back to it's natural supporters. But Labour had better watch out, because if they won the next GE, but couldn't borrow enough money to finance their client estate, and many more taxpayers are out of work - hey presto - their 'clients would start feeling the pinch as well'! ...and Damian Green should lead our MPs into the chamber of the Lords, standing next to Brown throughout. There is a more serious side of all this political argy-barging and obfuscation, by this government. It seems that there has already been an illegal immigrant working in the HoC's - unknown, I presume. That doesn't inspire much confidence in this government's capacity to be watchful enough to prevent more serious intrusions, perpetrated by cleverly determined people. Yes they are quick enough to apprehend British/English people, guilty maybe of similar actions that Labour have also committed, and play footsie games of one-upmanship in the House itself, but could they start taking their jobs more seriously, and think about what has just happened in Mumbai, and how, apparently it has been suggested that some of the terrorists got access to the Taj Mahal Hotel, by apparently posing as bona fide hotel staff! You can't expect the police to DO everything from vetting immigrants, and jobseekers and goodness what else, while you 'play games'! "New Poll - a rogue, or I'm leaving the country. I mean it; if people are stupid enough not to see what's going on at the moment I don't want them picking the government." "Where can you get the green ribbons?" If you go to Google images and type in "green ribbon" you can find some nice images which you can then download to your computer and copy to your Facebook page, website or blog. I have no doubt that someone at the Met or in Government will resign before the end of the year. I also, think the Conservatives should find a way to ease Mr Martin out the door, not because he is Scottish which would be enough for some on here, but because he is incompetent and bad for our democracy. Good on yer, Plod. Keep the enquiry going because Green is innocent until proven guilty (not that anything will become of it - I dont know why we bother) Do not allow the politicos to brow beat you, just like they do the public. Have you heard the latest what the politicos are up to including the opposition: they intend to charge us for non-existing global warming. I wish they would keep their mouths shut - more snow is expected this week. Does this mean that Ms Harman will now be arrested for leaking? It would be great if MPs would demonstrate their support for Damian Green by sporting green ribbons in the Commons on Wednesday, during the Queen's Speech. It shouldn't be difficult for MPs to lay their hands on some green ribbon - John Lewis, their retailer of choice, sells the stuff. So it has come to this. Democracy is trampled on and people think that wearing a green ribbon will suffice as a response? The "leak" has been confirmed as one of those auto-complete errors that happen when you start typing a name ino the "to" line in Outlook. So no danger of arrest today! If you think of the great campaigns all of them have had a symbol and peaceful demonstration has to be the way. I still think a march in London one saturday would certainly make the feelings clear. As Trevor Kavangh said yesterday if this had been the tories the swp liberty etc would be in the streets by now talking of right wing dictatorships. We have to show our anger at this and of many people up and down the country Labour and the Police need to know they do not have a licence to bully us into submission. Where do i get my Green Ribbon and when is the march? The implications of a meeting which seems to be expressly designed (as per Nick Robinson's report on Today: "to check the lie of the land, that they all understood each other's positions") to ensure the parties get their stories aligned with one another are very grave. The BBC are talking about Tory demands to attend as though they are upset at not being invited to a party. Do none of them understand that the Speaker is meant to be impartial and any such meeting should be cross party? Isn't it about time that somebody booted out the Speaker? Even the vaguest hint of impartiality would make a nice change. "Isn't it about time that somebody booted out the Speaker?" Here is you chance to make your feelings clear. Perhaps the Hon Member for Beaconsfield might like to ask the Acting Commissioner of the Metropolitan Police. Sky News understands the Tories will release a video of the raid on Damian Green's parliamentary office following his arrest as part of a leak inquiry. It's a sad day when HM Opposition need to take a video of HM Police for their own protection. I bet Jackboot Jacquie is flummoxed and her knitting will in a right mess with dropped loops and 'stitches' all over the floor when she see's that video. "Where do i get my Green Ribbon and when is the march?" As far as getting hold of a green ribbon is concerned - as someone else has suggested - nip along to your local John Lewis (or similar outlet) and go to their haberdashery department. With the aid of a pair of scissors and a small gold safety pin you'll be able to make something similar to the red AIDS ribbon or pink Breast Cancer one. To get a digital one to put on your website/blog or Facebook page, just go to Google images and type in "green ribbon"! Be careful what you wish for, she's a dangerous woman! I made a slightly different version of the green ribbon as I didn't like the straight text, although I'm sure someone else could do better. David Cameron and Nick Clegg plan to meet to discuss plans to secure a Commons debate on the row over Damian Green's arrest, the BBC understands. I hope you approve of today's front page! Green ribbons are a good idea but we need to concentrate our efforts on convincing lunatics like Don'tmakemelaugh and whoever produced that poll, to kick this out-of-control mob at Westminster into touch at the next election. Or God help the future of this country.